Here we are into March already and I am wondering where the time goes as I get older. It never seemed to pass so quickly years ago. Hope your week is going well and thank you for joining me here at Jumbled Crafts. At Tag Tuesday we still have about 5 days to go for the Spring Flowers Challenge. The theme was chosen by Valerie and we have some wonderful tag entries from old and new friends of TT. Hope you will join us there. 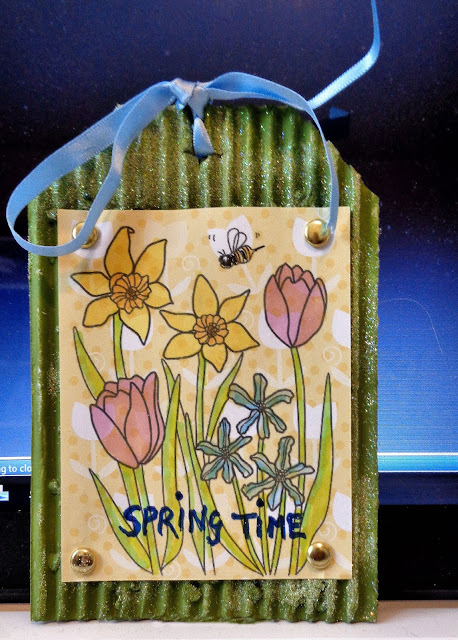 For this tag I painted some corrugated card in green and then added white glitter for texture. The picture is a child's colouring page I found online and coloured with Promarkers. I used things that were on my craft space to make this tag--a bit of purple card, a piece of flowered paper,and a little bit of mauve material. The quote that I had printed out and never used and the butterfly cut out from one of my birthday cards as was the ribbon. I think these things were just waiting to be made into a tag. Last but not least our lovely friend Yvonne is the March host at Art Journal Journey and has chosen Out and About as her theme. Beautiful tag Chrissie, the flowers are pretty and I was really drawn to the quote on the second one especially as it mentions my favourite brew. 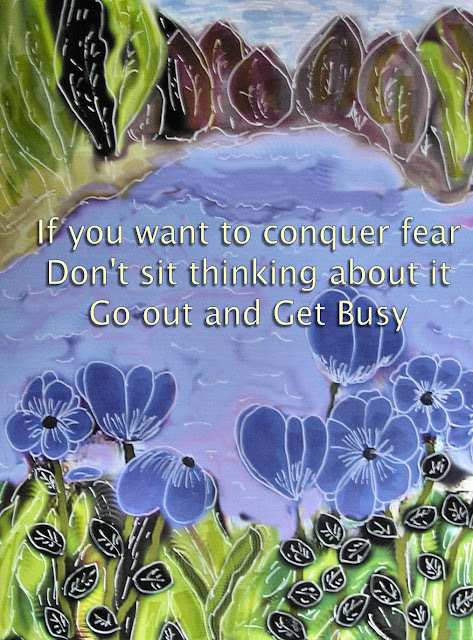 Thank you for a fantastic page for my theme choice at AJJ, its a beautiful painted background and the words quote is so meaningful, a message for many of us to face the day and do more in our lives. Amazing tags and such a pretty page for Yvonne's theme! Same to me with the time .. lol! Love the spring flowers against the shimmering green corrugated card. And so nice to see how the scraps around the craft space came together in the charming purple butterfly tag. The digi page is a real delight... I should like to go and sit by that lake - definitely tempting me to get out and about, and the words are wonderful. As usual gorgous artwork, Chrissie. Fabulous colourful projects and I love the corrugated card tag. Both tags are incredible. I especially liked the one about the tea. I may have to steal (OOPS, I mean BORROW) that quote from you. Your journal page is remarkable. You brought those flowers and that water to life with this great background. It is stunning. ALL of them so very beautiful, love the quotes. Great post Chrissie! Beautiful tags and a fabulous page. Love the quote! Your tags sure are beautiful! And I love your quote and journal page! wonderful your tags and this journal page!!! 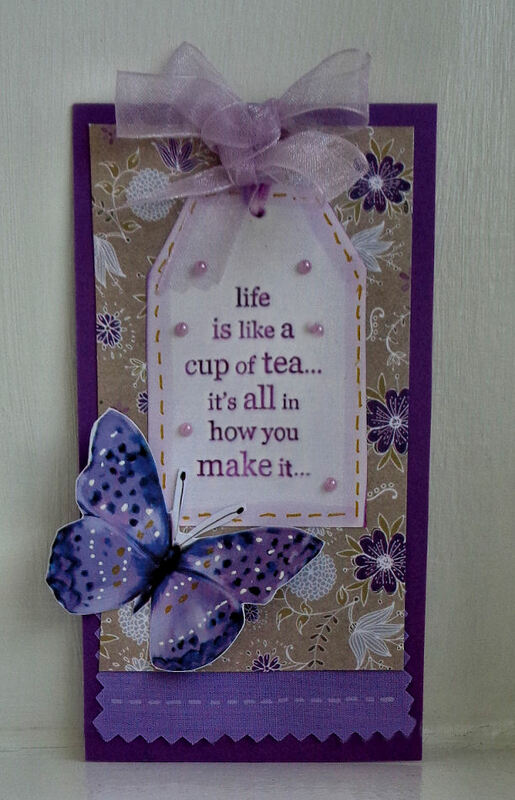 A beautiful Tag Chrissie,I love the colours and love that sentiment too...life always seems so much better with a cup of tea. I enjoyed your tags and quotes. Lovely well done.